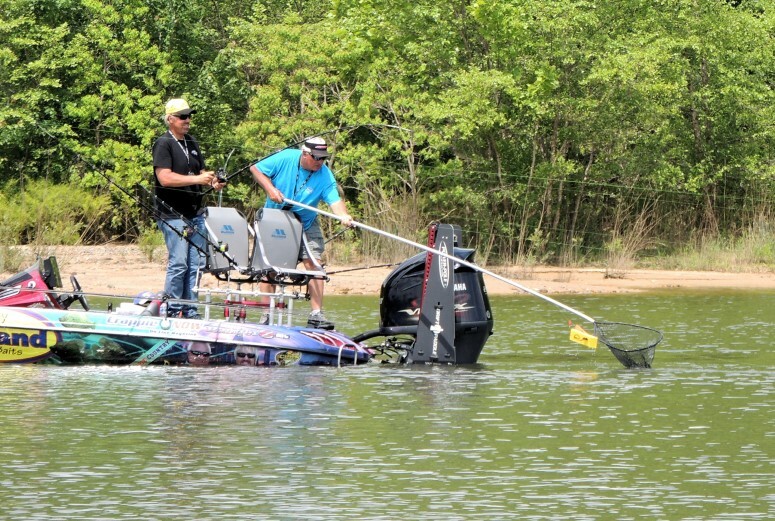 There is no one cookie-cutter setup that applies to every crappie fishing boat. The following are good product and design ideas that can help make most fishing rigs more comfortable and efficient. 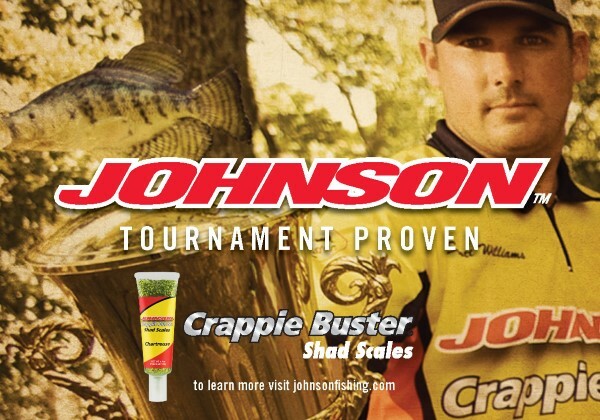 Fishing rods are one of the most important pieces of equipment a crappie angler has. It is important to protect them. There is nothing worse than beginning that first pass through a crappie hole and discovering a broken tip or handle. The Rod Locker secures crappie rods and reels for roadside stops while protecting sensitive tips from abuse and damage in transit. Fishing rods take plenty of abuse from anglers while fishing, but more when in transit from one location to another. 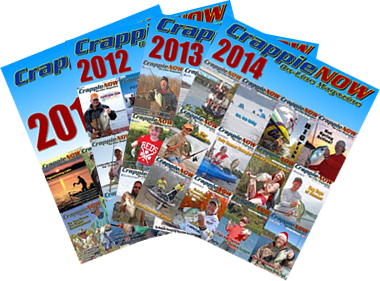 No one knows better that Dan Dannenmueller, one half of the Crappie Country Fishing Team. He and his fishing partner, Garrett Steele, travel the country fishing crappie tournaments and they haul a lot of B’n’M rods with them. 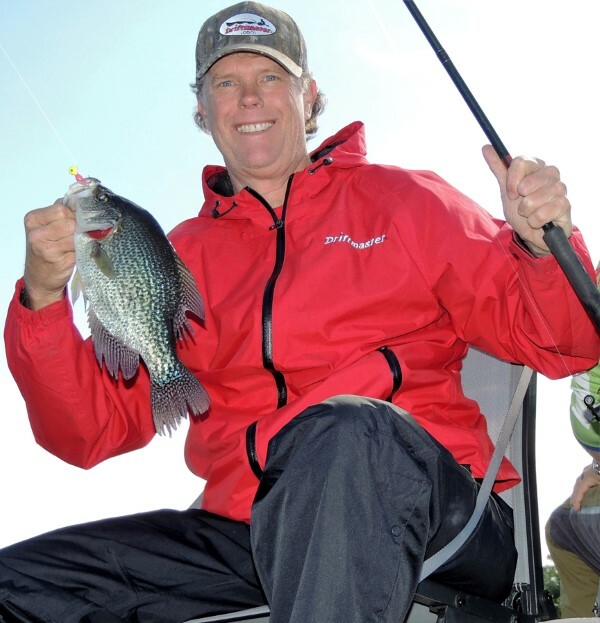 Crappie Dan contacted David Baynard with Driftmaster Rod Holders concerning the issue of transporting rods. He discovered that Baynard was already working on a system to secure long crappie rods above the gunnel of a boat. After many improvements and revisions, the new Driftmaster Rod Locker features accessibility, protection and security. The newest versions easily accommodate eight pre-rigged rods and keep them from tangling. With the locking cover in place thieves cannot remove the reels from the rods so they remain safe too. Standard versions feature an 8-inch vertical stem to clear boat hatches and leave them accessible. David Baynard, Driftmaster owner and designer, shows off the results of using add-on accessories to the angler’s best advantage. The tip saver end holds each rod separately and protects them between rubber coated fingers. 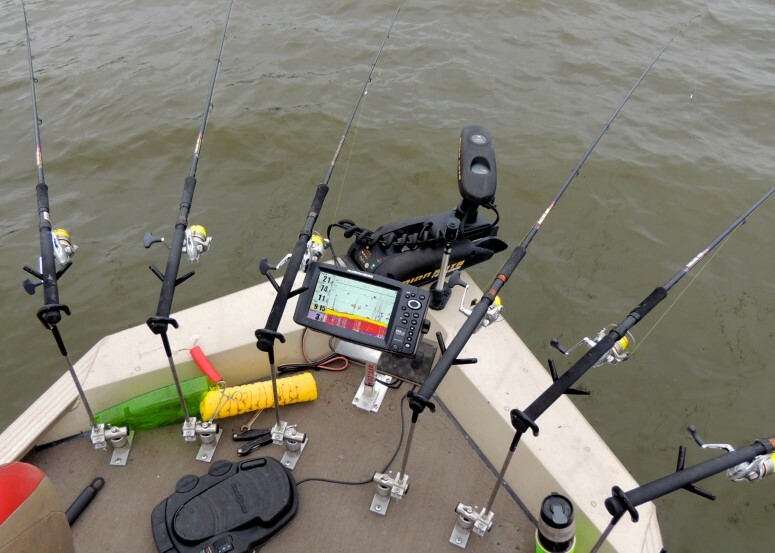 The middle and the tip saver end can be mounted to accommodate different rod lengths and boat configurations. The Rod Locker can be easily removed when not needed. 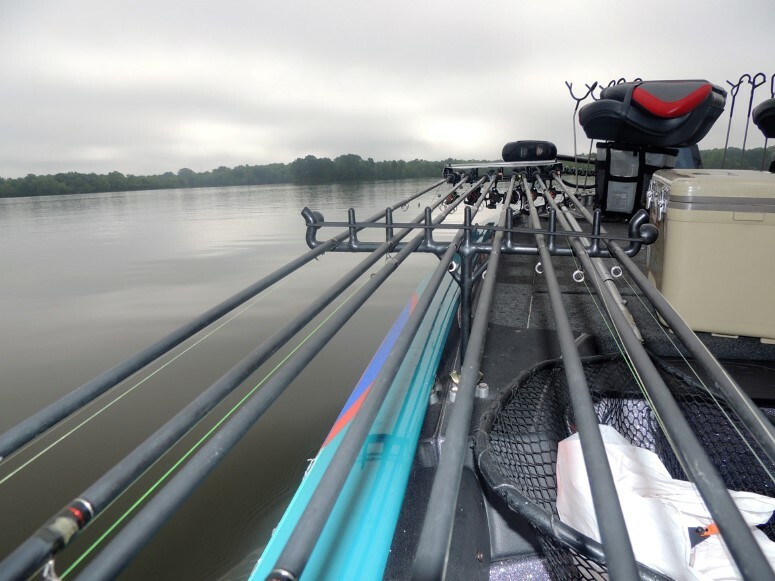 The rod rack on the back of the Crappie Country boat is designed to allow two anglers to work the planner boards and still leave room for netting the fish. 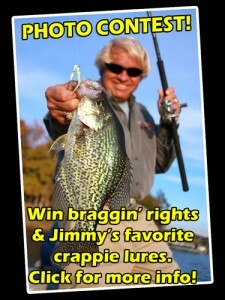 Crappie Stalkers are shown here on guide Jim Forrest’s boat. They can be ordered customized for additional height and an angle to give knee room. Since the Stalkers are individual rod holders they do require more holes drilled in the boat. For anglers that don’t like that, Driftmaster offers systems that fit in the seat hole that can be removed when not in use. These systems require no new holes at all. He went on to explain the difficulty of keeping the lines separated when turning with the boards 200 feet behind the boat on each side. He asked Driftmaster to develop a rear rod rack that would accommodate the requirements of pulling boards and allow two people to fish them effectively. The carefully thought out response was a rack design that followed the outside contour of the rear deck and could be either inside or outside that contour. They are constructed so there is room to get underneath them to net a fish and not in the way of trees or anything you might run up against when you are not fishing with the boards. 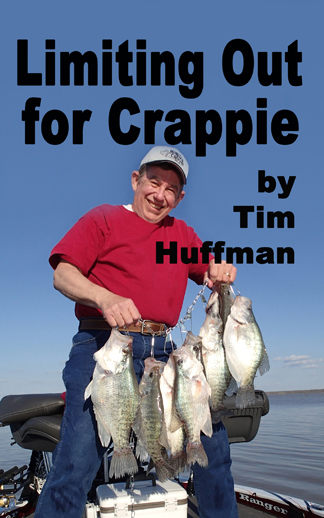 Crappie anglers are innovators and never stop looking for better ways to catch fish. Sometimes it is only a matter of adapting existing products and accessories to your own style of fishing. 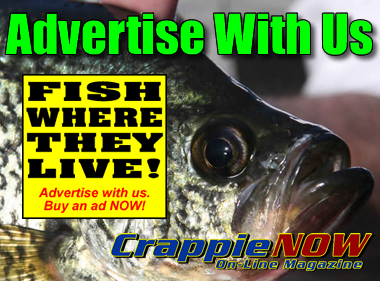 Follow the lead of Crappie County, be creative, and make your crappie fishing better through innovation.